I joined Minute Maid's Pump up Your Blog Contest. The mechanic was so easy that it was some sort of fill-in-the blanks with the right adjectives. There are two ways to win, pump up your blog with their backgrounds or join the blog contests and post some comments with your fellow contestants. I chose the latter. 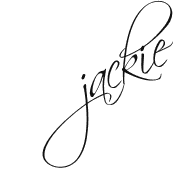 I used to join so many contests via blog and so far, I won twice already out of so many contests lol! 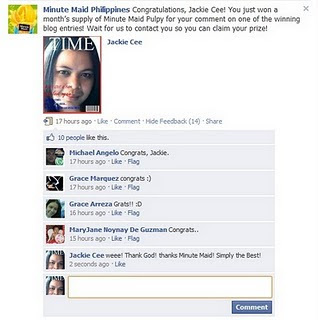 Anyway, to make the story short, I was so surprised when my co-blogger Kayce congratulated me on my fb wall for winning one month supply of Minute Maid being the Best Commenter! Wow, I was really flabbergasted! See my reply? I was really surprised then. I patiently wait for my Minute Maid supply to arrive, though it took quite a while but the long wait is over. Mom, are you trying to count 1 up to 12? It was my mother who received the package, a door-to-door delivery from Air21 yesterday afternoon. The package contains one case of 1L Minute Maid x 12 bottles. Thank you Coca-cola, see the date this pic was taken? And so, since I do not go home regularly, I asked my Mom to bring me some, and yes I got it! Though she brought only two and gave the other one to her colleague it's still okay. I will let them enjoy the healthy goodness of Minute Maid at home. Weee.... finally, my thirst for pulpy orange juice will be quenched! 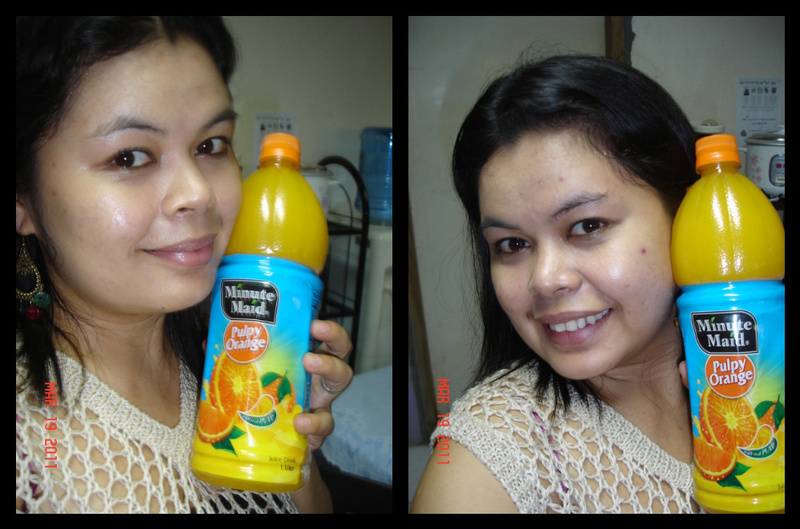 A bottle of Minute Maid a day, help keeps the cough and cold away! wow! your lucky indeed! enjoy! Wow, I also like Minute Maid and buy them whenever I'm in the mood for a cold drink -my substitute for cola. Congratulations for that. Minute Maid is good! My Mellow Yellow, come and see. Have a lovely Monday! You lucky duck! I love OJ, but hate the pulp! Congrats, hope you enjoy all of it. http://stillblondeafteralltheseyears.com/2011/03/google-changes-its-algorithm-good-news-for-bloggers-with-great-original-content/ Stumbled yours, please stumble mine. Stumbled! If you haven't already, I hope you link up again this week.